Taken a couple of weeks ago at the top of town at 1pm. Tom, please explain what is going on. Are stilts involved? Gosh, ages since I've seen Wigan as busy as this. Interesting photo. Ernest , I'm affraid I can't say what the display was supposed to represent,surfice to say it was a busking event. As to stilts, the second man must be using such contraptions, otherwise he surley would be in record books!. Street entertainment of this sort does no harm,in fact,add a little variety to our town centres,and it is up to the individual ,to support the participants,or not,as you choose. Regards Tom. I like your photo Tom and I also love street entertainment - I just always seem to be in the wrong street and miss it! 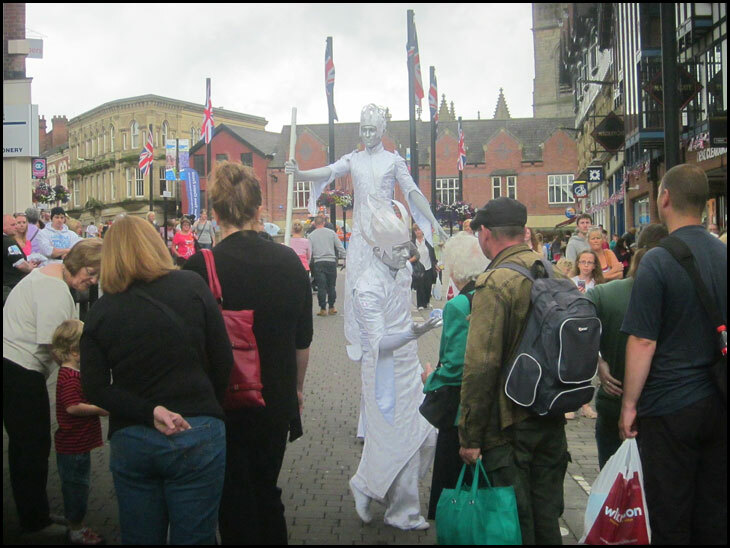 The `statue` man, dressed in white attire, was in Standishgate again today, near to and on same side as B & M.
It`s the loud `rock` music in public places that I object to.